1. Mix flour, salt and water to make soft dough (water may be need more or less for soft dough). You can use your hand or food processor to make the dough. 2. Knead the dough for few minutes until it becomes smooth dough. 3. Cover the though and let it sits for 10-15 minutes. 2. Mix with potato, onion, chilli, cumin powder, coriander and salt together. 1. Divide the dough and potato stuffing into 7 equal sizes. The potato ball will be about 1.5 times larger than the dough balls. 2. Roll the dough into 3 inch diameter circles and place the stuffing ball in the middle. Seal the edges by pulling them together and make a ball. 3. Make all 5 balls same way. 4. Let them sit for 3-4 minutes before rolling them. Otherwise it will be hard to roll. 5. Heat the frying pan (thick base preferred) on medium heat. 6. Roll the ball. It will be easier to roll if you roll the ball in dry flour first. 7. Carefully roll the ball on the sealed side. You have to very light handed to roll the paratha in 7″ diameter. 8. Place the paratha over the frying pan. Soon you will see the paratha change color and puff in different place. 9. Turn over the paratha. Now spread 1 teaspoon butter or oil on the paratha. Turn again and spread the butter this side too. 10. Press the paratha slightly with a spatula. Flip the paratha again and make sure the paratha is golden brown in both sides. Fry all parathas same way. 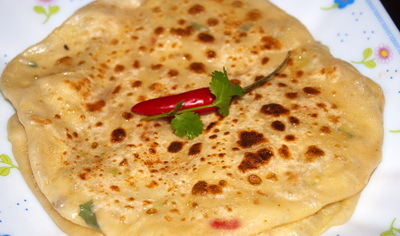 Now you can enjoy your homemade Aloo Paratha. 2. All ingredient need to be finely chopped. 3. Mash the potatoes thoroughly. I’m very pleased with some of the recipe,I will try them at home,and please give us some more quick Iftar recipe. Glad to know that you like at least some of recipes. i will post soon some easy iftar recipe. Thanks.